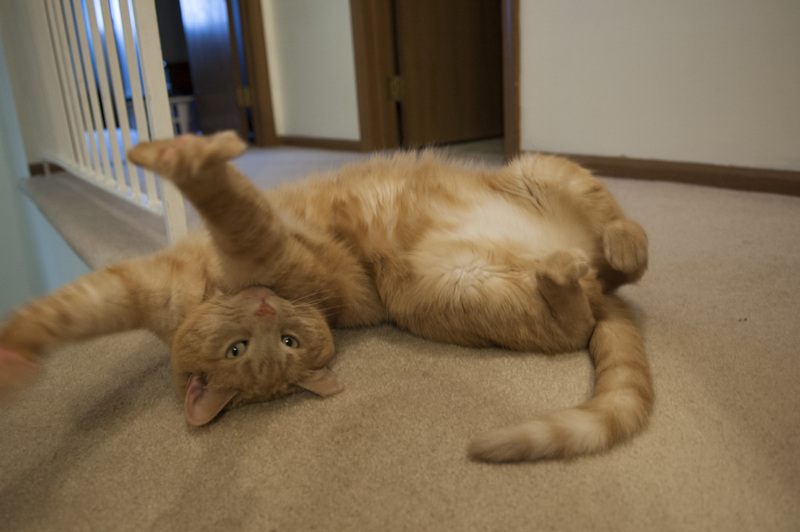 Meet Oliver, our big orange kitty. At 16 pounds, he’s large and in charge – the complete opposite of the scrawny kitten we brought home from the shelter 5 1/2 years ago. He’s the perfect mix of predator and sweet lap cat, but for all that he hypes his hunting skills, he’s never been outside and is afraid of his own shadow. Though not totally his fault, he’s made life around our house much more interesting since the beginning of the year. Monday 31 December, 6:00pm As has become tradition in recent years, we have some guests over for New Year’s Eve. Oliver tends to get stressed out around people he doesn’t know, so we set him up in a bedroom with his food, toys, and litter box. 7:00pm One of our guests goes upstairs to see Oliver, accompanied by my wife Michelle. They were trying to pet Oliver and play with him, but Oliver got scared and was backing away. Eventually finding himself cornered, Oliver went into self-defense mode and tried to bite our guest in order to get away. Michelle intervened and ended up getting bit on her middle finger. She was bleeding a little bit and cleaned it up immediately with soap, water, and rubbing alcohol, finishing with a bandage. I saw that she got bit, but didn’t think much of it. We’ve both been bitten hundreds of times before so no big deal, right? Unbenkownst to me as the evening went on, Michelle’s bandage kept on getting tighter and tighter. She changed it at one point, thinking she had put it on too tight. She also thought maybe her finger was broken. It continued to swell and throb with pain. Tuesday 1 January, 1:00am Our guests leave and Michelle tells me that her finger has been swelling the entire evening and is now to the point that she can no longer move it. Since that’s clearly not a good sign, we head to the emergency room. Thankfully it’s still slow there as most bars haven’t closed yet. We are seen right away. 2:30am After a thorough cleaning and x-ray, we head home with a prescription for large antibiotic pills. The doctor says it may take a day or two for the drugs to kick in, but we should return if Michelle gets a fever. It’s a crappy way to start 2013, but we figure the worst is behind us. 12:00pm Her finger definitely doesn’t look any better yet, in fact it looks like it might be swelling even more. Since she’s been on the drugs for less than 12 hours, we decide to give them some time to work, rather than being those people that run right back to the ER. 9:00pm It’s definitely swelling more and oozing some pus as well. Comparing to photos we took earlier, it looks like her adjacent fingers are also swelling a little bit. We still aren’t at the 24 hour mark though, so Michelle opts to sleep on it and return to the hospital in the morning if things don’t appear better. I am told to go work like usual and she will keep me posted with what’s going on. 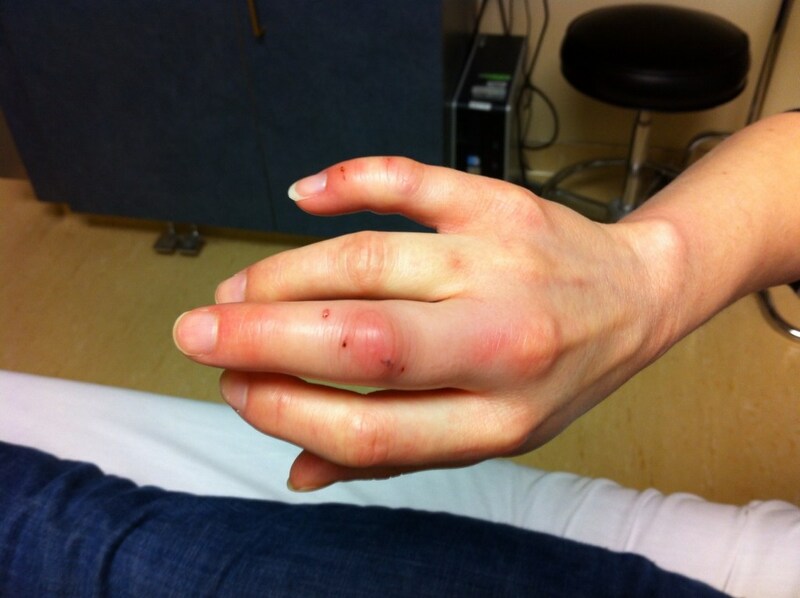 Wednesday 2 January 7:00am Michelle sends me a photo of her hand and it’s looking worse yet. 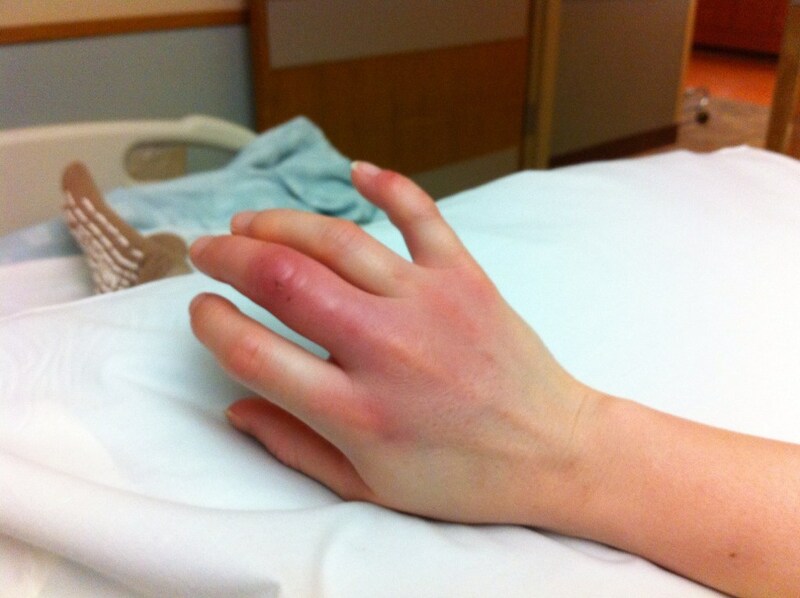 The adjacent fingers are definitely swollen, and the swelling and redness is starting to spread down the back of her hand. I forward the photo to one of my closest friends who happens to be a clinical pharmacist. She shows it to some doctors she works with and their replies are along the lines of “What hospital is she at and what are they treating her with?” She advises me to have Michelle go back to the hospital immediately. 8:00am Workaholic that she is, Michelle goes to work to make sure all her things are in order. Despite the fact that her body is battling a major infection, she’d rather make sure her preschoolers have their juice ordered before checking into the hospital. 9:30am Michelle heads back to the emergency department, and is started on IV antibiotics and painkillers. They decide to admit her soon after. I catch the first available train out of Chicago, but that’s not until the early afternoon. 4:00pm I join Michelle at the hospital. She’s seen by a few doctors. They tell her that a hand surgeon will be coming to see her, but they probably won’t be doing anything until tomorrow. 5:30pm Michelle is seen by an orthopedic hand surgeon. He takes one look at it and says he’s going to do emergency surgery immediately. 10:00am Infectious disease doc comes in and says that whenever Michelle is discharged, she will be on IV antibiotics at home for a month. She doesn’t explain this very well, and leads us to believe we’ll have to use needles and give her an IV once a day. This does not sound pleasant. 10:15am Our nurse sees Michelle freaking out at the thought of having to deal with needles every day, and explains that she will be getting a PICC line and there are no needles involved. Crisis averted. 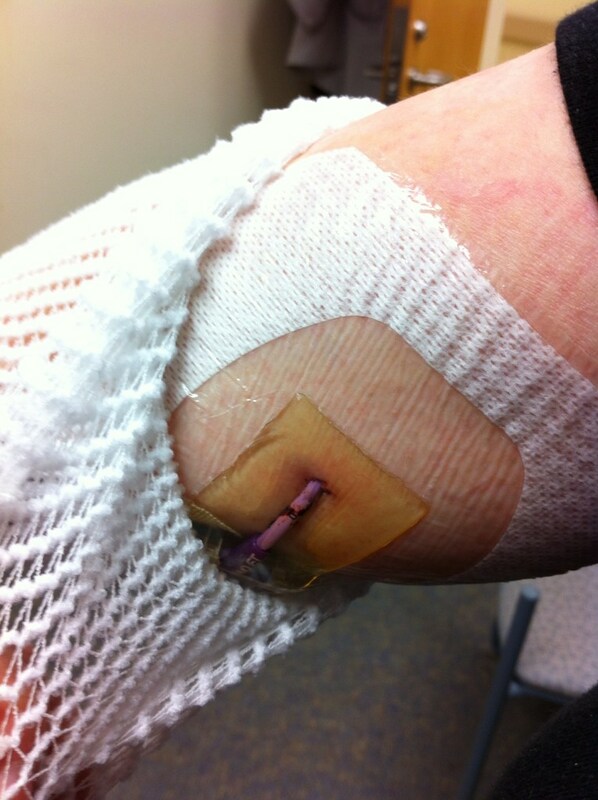 12:30pm PICC nurse comes to give Michelle her PICC line. It’s a sterile procedure so I have to leave the room. We spend the rest of the day watching TV, taking a couple of laps around the floor, and talking with Michelle’s sister who came to visit us. I also learn how to put her hair in a ponytail. I learned a lot of knots in Boy Scouts, but they all have nothing on a good ponytail! Friday 4 January 6:30am Orthopedic surgeon comes in and removes the dressing. 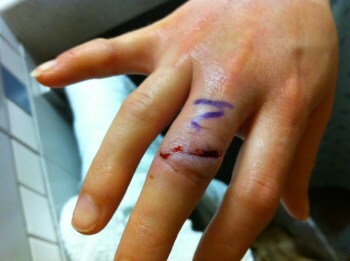 Her finger looks pretty good considering everything it’s been through. The doctor left the wound open (no stitches) so that it would drain itself if necessary. He says as far as he’s concerned Michelle should be going home today, though the infectious disease doc will have to agree. 4:00pm Drug finally arrives from pharmacy. Over the time we’ve spent in the hospital I’ve crafted Pusateri’s Law™: Pretty much every time the hospital gives you a timeline for something, it will really take at least four times as long as they claim. 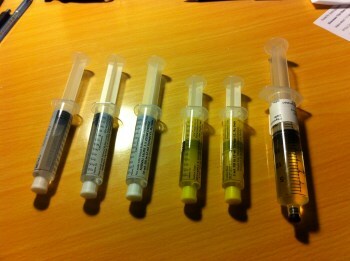 Since then we’ve gotten into the routine of doing Michelle’s medication infusion every evening. 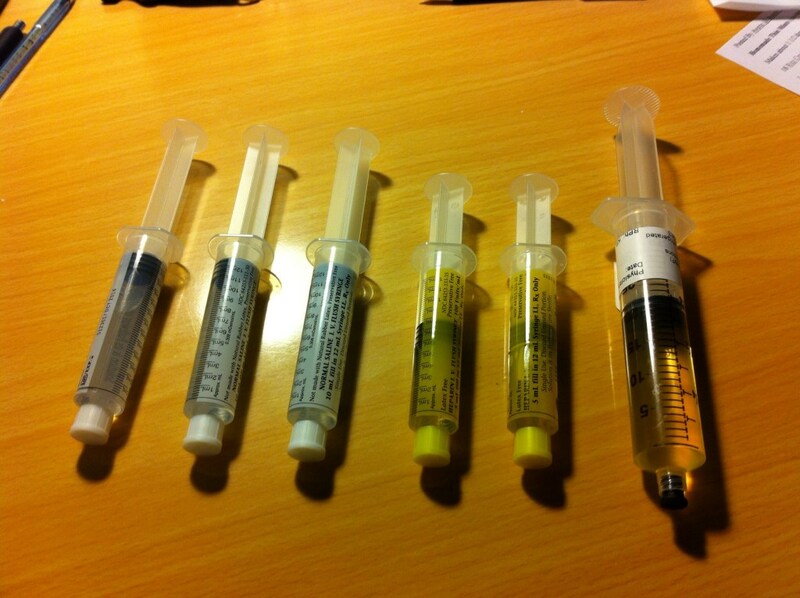 With the drugs and various flushes it comes to 6 syringes per day. She also gets weekly visits from a home care nurse who comes to change the dressing on her PICC. Two weeks ago she had to have her PICC removed and re-placed on her other arm due to a blood clot forming near it (this is not typical.) Her finger is healing nicely but she has yet to regain full motion in it and will be starting occupational therapy soon. Cats are not evil, but when you corner them (or any other animal) they will of course protect themselves. If you find yourself bit by one and the area starts swelling, get to an emergency room immediately. We were told that over 80% of cat bites result in an infection, way more than dogs. This is because cat teeth are long and skinny and create puncture wounds that can deposit bacteria very deeply beneath the skin. Update: Several people have asked if we got rid of Oliver. Absolutely not!! He’s not a mean cat at all – he’s our baby and he was just reacting like any other scared animal would. Neither of us can imagine life around our house without him. Yeah, I’ve read about this before. I’m glad Michelle is okay. Our orange tabby is very playful, and sometimes bitey, but we’re quite lucky that we’ve not had a same reaction. Thanks! It can only get better from here, right?!? When I started reading this I thought I was finally going to get to see Michelle without a big smile on her face. WRONG!!! I’m so glad you are alright. She’s such a tough cookie! I’m not sure I could handle all the poking and prodding like she did!! Wow Bob! So glad she is OK! Didn’t think you two would have to deal with “in sickness and in health” so soon. So glad Michelle is on the road to a full recovery. Also glad she’s got a great husband to help care for her. (Love you, Bob) May this be the only medical emergency the two of you ever encounter. I have a whole new appreciation for them now!! Oh my gosh! I’m glad to hear Michelle is recovering well. Hugs to both of you! Ugh! My Mom and Grandpa were both bit by cats, and got a pretty nasty infection. Neither of them had to have surgery, or anything as serious as Michelle, but both were on some pretty heavy duty antibiotics for a long time. I’m glad she’s ok!!! Yeah it’s crazy! I mean yeah we figured infection was a possibility, but nothing like the ordeal it turned out to be!! Just came across this as I was looking up cat bites and I no longer feel alone. I was bit by my cat on Aug. 17 and was at the ER within 2 hours of being bit. When the vet told me to go to the ER immediately I thought he was crazy, little did I know. I had surgery on my hand Aug. 20th and am still on IV Antibiotics, hoping they come out next week. Everyone is in disbelief over this and they also ask if I still have my cat. Of course I do!!! This was a freak accident (my hand being in the wrong place at the wrong time)and she has been a member of our family for 19 years and isn’t going anywhere as long as I have anything to say about it. I hope Michelle’s hand is doing well, I know the physical therapy isn’t fun but it is getting better each time and I was told to expect up to 6 months for full range of motion and movement to come back. If cats only knew the power they had we’d all be in trouble!!! Good luck. It’s just crazy, isn’t it Kim? 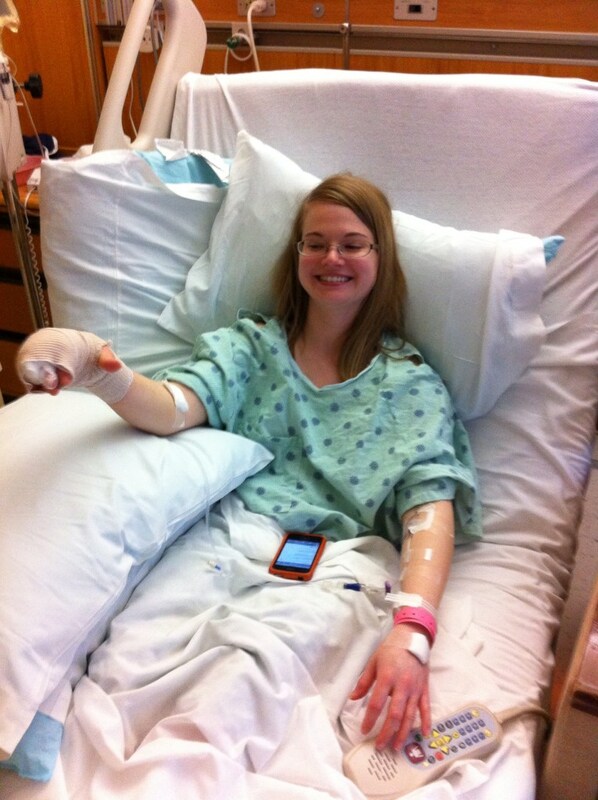 Michelle now has full motion in her finger again after about 2 months of therapy. Hope all goes well and you’re good as new soon. Thanks for reading! Another random person who came across this after looking at cat bites. I was bitten by a stray cat that I cornered (I was taking it to the shelter since the weather forecast for the night was -17C). It drew blood, I didn’t clean the wound, but did at least head to the ER to get antibiotics (I don’t have a family doctor). The bite was Tuesday and now it’s Thursday. Yesterday I was at the hospital getting rabies injections, including a ‘HRIG’ into my finger – that really hurt so I passed out. So far things look OK with me. My finger is swollen (but probably from all the rabies immunoglobin fluid they forced into it) but will keep an eye out. Anyway, just wanted to say that I sympathise with your wife and I hope she’s recovered from her ordeal! Btw, when I say a cat bit me….. honestly, it was actually a kitten. Embarassing. So sorry to hear that happened! It’s crazy how things can escalate, isn’t it? Hope you can put all this in your past quickly, and thanks for sharing!